Internal Transfers can be found in the Purchase Orders section of Shopventory and are very similar to external PO's. The Internal Transfers function is considered a part of Purchase Orders. Before a product can be transferred, it must be enabled at both the sending and receiving location, and have a positive quantity in stock to move. Click on the Create Transfer button to get started! Be sure to leave any helpful notes at the bottom! As soon as a transfer is created, variant quantities will be deducted from the sending location. NOTE: Once an Internal Transfer is created, it can no longer be edited. You can always save a draft if there's any possibility the information may change later on. Once you have entered the quantities, you can save and adjust to update the inventory. Transfers can be canceled by using the Cancel Transfer option. 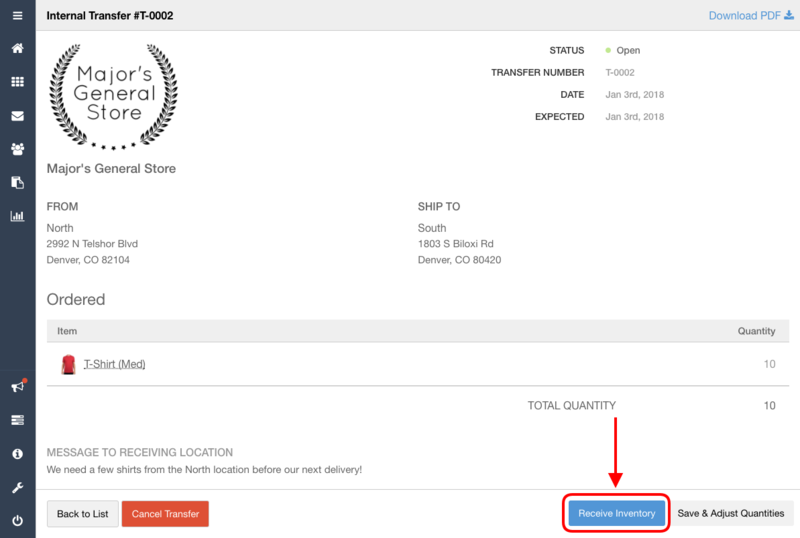 You'll have the option to return products back to the sending location or mark them as lost in transit. Each Internal Transfer will show all products that were transferred in a given order. Individual products will still have their individual Inventory History updated. All updates and changes will have user identities logged.